Guntersville, Alabama is one of the most desirable towns in America offering citizens and newcomers a warm and friendly community with an excellent quality of life, a superb school system, a thriving arts community, numerous recreational opportunities and excellent shopping and dining experiences. Guntersville has been featured in Where to Retire magazine; named the Best Lake in Alabama by Southern Living; Relocate America featured Guntersville in their list of the 100 Best Places to Live in America; and Field & Stream named Guntersville as one of the Top 10 Fishing Towns in America. 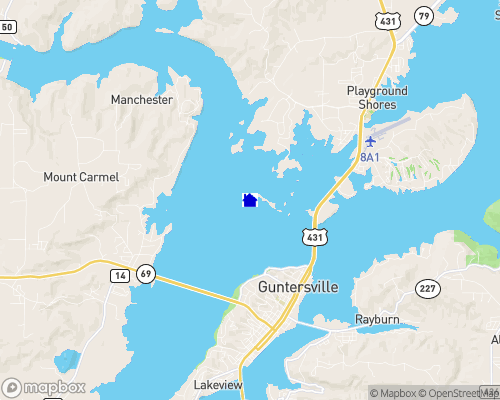 Guntersville is located on the southernmost point of the Tennessee River and offers a convenient, dynamic, affordable and friendly place to live. Guntersville invites you to share in the life of this breathtaking community!